Meteoric nickel is found in combination with iron, a reflection of the origin of those elements as major end products of supernova nucleosynthesis. 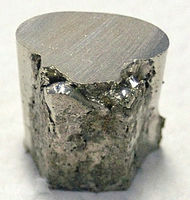 An iron–nickel mixture is thought to compose Earth's outer and inner cores. Nickel is one of four elements (the others are iron, cobalt, and gadolinium) that are ferromagnetic at approximately room temperature. Alnico permanent magnets based partly on nickel are of intermediate strength between iron-based permanent magnets and rare-earth magnets. The metal is valuable in modern times chiefly in alloys; about 68% of world production is used in stainless steel. A further 10% is used for nickel-based and copper-based alloys, 7% for alloy steels, 3% in foundries, 9% in plating and 4% in other applications, including the fast-growing battery sector. As a compound, nickel has a number of niche chemical manufacturing uses, such as a catalyst for hydrogenation, cathodes for batteries, pigments and metal surface treatments. Nickel is an essential nutrient for some microorganisms and plants that have enzymes with nickel as an active site. Nickel is a silvery-white metal with a slight golden tinge that takes a high polish. It is one of only four elements that are magnetic at or near room temperature, the others being iron, cobalt and gadolinium. Its Curie temperature is 355 °C (671 °F), meaning that bulk nickel is non-magnetic above this temperature. The unit cell of nickel is a face-centered cube with the lattice parameter of 0.352 nm, giving an atomic radius of 0.124 nm. This crystal structure is stable to pressures of at least 70 GPa. Nickel belongs to the transition metals. 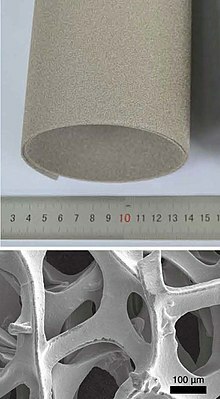 It is hard, malleable and ductile, and has a relatively high for transition metals electrical and thermal conductivity. The high compressive strength of 34 GPa, predicted for ideal crystals, is never obtained in the real bulk material due to the formation and movement of dislocations; however, it has been reached in Ni nanoparticles. However, each of these two configurations splits into several energy levels due to fine structure, and the two sets of energy levels overlap. The average energy of states with configuration [Ar] 3d9 4s1 is actually lower than the average energy of states with configuration [Ar] 3d8 4s2. For this reason, the research literature on atomic calculations quotes the ground state configuration of nickel as [Ar] 3d9 4s1. Fe, more abundant elements often incorrectly cited as having the most tightly-bound nuclides. Although this would seem to predict nickel-62 as the most abundant heavy element in the universe, the relatively high rate of photodisintegration of nickel in stellar interiors causes iron to be by far the most abundant. Ni with 6 days. All of the remaining radioactive isotopes have half-lives that are less than 60 hours and the majority of these have half-lives that are less than 30 seconds. This element also has one meta state. Ni with 28 protons and 50 neutrons. Both are therefore unusually stable for nuclides with so large a proton-neutron imbalance. Australia and New Caledonia have the biggest estimate reserves, at 45% of world's total. 3, while Ni(III) is present in nickel oxide hydroxide, which is used as the cathode in many rechargeable batteries, including nickel-cadmium, nickel-iron, nickel hydrogen, and nickel-metal hydride, and used by certain manufacturers in Li-ion batteries. Ni(IV) remains a rare oxidation state of nickel and very few compounds are known to date. In medieval Germany, a red mineral was found in the Erzgebirge (Ore Mountains) that resembled copper ore. However, when miners were unable to extract any copper from it, they blamed a mischievous sprite of German mythology, Nickel (similar to Old Nick), for besetting the copper. They called this ore Kupfernickel from the German Kupfer for copper. This ore is now known to be nickeline, a nickel arsenide. In 1751, Baron Axel Fredrik Cronstedt tried to extract copper from kupfernickel at a cobalt mine in the Swedish village of Los, and instead produced a white metal that he named after the spirit that had given its name to the mineral, nickel. In modern German, Kupfernickel or Kupfer-Nickel designates the alloy cupronickel. More thant 2 million tonnes of nickel per year are mined worldwide, with Indonesia (560 t), The Philippines (340 t), Russia (210 t), New Caledonia (210 t), Australia (170 t) and Canada (160 t) being the largest producers as of 2019. The largest deposits of nickel in non-Russian Europe are located in Finland and Greece. Identified land-based resources averaging 1% nickel or greater contain at least 130 million tons of nickel. Approximately 60% is in laterites and 40% is in sulfide deposits. In addition, extensive deep-sea resources of nickel are in manganese crusts and nodules covering large areas of the ocean floor, particularly in the Pacific Ocean. 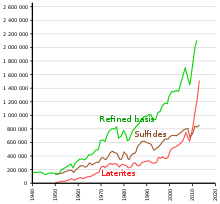 The market price of nickel surged throughout 2006 and the early months of 2007; as of April 5, 2007, the metal was trading at US$52,300/tonne or $1.47/oz. The price subsequently fell dramatically, and as of September 2017, the metal was trading at $11,000/tonne, or $0.31/oz. The global production of nickel is presently used as follows: 68% in stainless steel; 10% in nonferrous alloys; 9% in electroplating; 7% in alloy steel; 3% in foundries; and 4% other uses (including batteries). Ni, with its half-life of 100.1 years, is useful in krytron devices as a beta particle (high-speed electron) emitter to make ionization by the keep-alive electrode more reliable. Around 27% of all nickel production is destined for engineering, 10% for building and construction, 14% for tubular products, 20% for metal goods, 14% for transport, 11% for electronic goods, and 5% for other uses. Raney nickel is widely used for hydrogenation of unsaturated oils to make margerine, and substandard margerine and leftover oil may contain nickel as contaminant. Forte et al. found that type 2 diabetic patients have 0.89 ng/ml of Ni in the blood relative to 0.77 ng/ml in the control subjects. Nickel released from Siberian Traps volcanic eruptions is suspected of assisting the growth of Methanosarcina, a genus of euryarchaeote archaea that produced methane during the Permian–Triassic extinction event, the biggest extinction event on record. The major source of nickel exposure is oral consumption, as nickel is essential to plants. Nickel is found naturally in both food and water, and may be increased by human pollution. For example, nickel-plated faucets may contaminate water and soil; mining and smelting may dump nickel into waste-water; nickel–steel alloy cookware and nickel-pigmented dishes may release nickel into food. The atmosphere may be polluted by nickel ore refining and fossil fuel combustion. Humans may absorb nickel directly from tobacco smoke and skin contact with jewelry, shampoos, detergents, and coins. A less-common form of chronic exposure is through hemodialysis as traces of nickel ions may be absorbed into the plasma from the chelating action of albumin. The average daily exposure does not pose a threat to human health. Most of the nickel absorbed every day by humans is removed by the kidneys and passed out of the body through urine or is eliminated through the gastrointestinal tract without being absorbed. Nickel is not a cumulative poison, but larger doses or chronic inhalation exposure may be toxic, even carcinogenic, and constitute an occupational hazard. Nickel compounds are classified as human carcinogens based on increased respiratory cancer risks observed in epidemiological studies of sulfidic ore refinery workers. This is supported by the positive results of the NTP bioassays with Ni sub-sulfide and Ni oxide in rats and mice. The human and animal data consistently indicate a lack of carcinogenicity via the oral route of exposure and limit the carcinogenicity of nickel compounds to respiratory tumours after inhalation. Nickel metal is classified as a suspect carcinogen; there is consistency between the absence of increased respiratory cancer risks in workers predominantly exposed to metallic nickel and the lack of respiratory tumours in a rat lifetime inhalation carcinogenicity study with nickel metal powder. In the rodent inhalation studies with various nickel compounds and nickel metal, increased lung inflammations with and without bronchial lymph node hyperplasia or fibrosis were observed. In rat studies, oral ingestion of water-soluble nickel salts can trigger perinatal mortality effects in pregnant animals. Whether these effects are relevant to humans is unclear as epidemiological studies of highly exposed female workers have not shown adverse developmental toxicity effects. ^ Pfirrmann, Stefan; Limberg, Christian; Herwig, Christian; Stößer, Reinhard; Ziemer, Burkhard (2009). "A Dinuclear Nickel(I) Dinitrogen Complex and its Reduction in Single-Electron Steps". Angewandte Chemie International Edition. 48 (18): 3357. doi:10.1002/anie.200805862. PMID 19322853. ^ Carnes, Matthew; Buccella, Daniela; Chen, Judy Y.-C.; Ramirez, Arthur P.; Turro, Nicholas J.; Nuckolls, Colin; Steigerwald, Michael (2009). "A Stable Tetraalkyl Complex of Nickel(IV)". Angewandte Chemie International Edition. 48 (2): 3384. doi:10.1002/anie.200804435. PMID 19021174. ^ Anthony, John W.; Bideaux, Richard A.; Bladh, Kenneth W.; Nichols, Monte C., eds. (1990). "Nickel" (PDF). Handbook of Mineralogy. Vol. 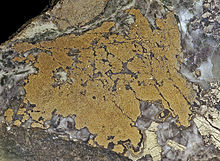 I. Chantilly, VA, US: Mineralogical Society of America. ISBN 978-0962209703. 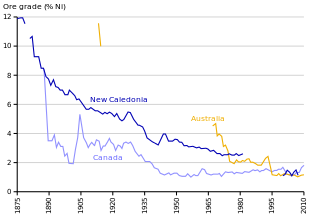 ^ "Nickel: Nickel mineral information and data". Mindat.org. Retrieved March 2, 2016. ^ Stixrude, Lars; Waserman, Evgeny; Cohen, Ronald (November 1997). "Composition and temperature of Earth's inner core". Journal of Geophysical Research. 102 (B11): 24729–24740. Bibcode:1997JGR...10224729S. doi:10.1029/97JB02125. ^ Coey, J. M. D.; Skumryev, V.; Gallagher, K. (1999). 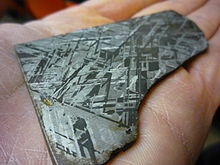 "Rare-earth metals: Is gadolinium really ferromagnetic?". Nature. 401 (6748): 35–36. Bibcode:1999Natur.401...35C. doi:10.1038/43363. ^ a b c "Nickel Use In Society". Nickel Institute. ^ "Nickel Compounds – The Inside Story". Nickel Institute. ^ Shiozawa, Hidetsugu; Briones-Leon, Antonio; Domanov, Oleg; Zechner, Georg; et al. (2015). 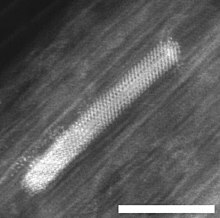 "Nickel clusters embedded in carbon nanotubes as high performance magnets". Scientific Reports. 5: 15033. Bibcode:2015NatSR...515033S. doi:10.1038/srep15033. PMC 4602218. PMID 26459370. ^ Kittel, Charles (1996). Introduction to Solid State Physics. Wiley. p. 449. ISBN 978-0-471-14286-7. ^ a b Hammond, C.R. ; Lide, C. R. (2018). "The elements". In Rumble, John R. (ed.). CRC Handbook of Chemistry and Physics (99th ed.). Boca Raton, FL: CRC Press. p. 4.22. ISBN 9781138561632. ^ Sharma, A.; Hickman, J.; Gazit, N.; Rabkin, E.; Mishin, Y. (2018). "Nickel nanoparticles set a new record of strength". Nature Communications. 9 (1): 4102. doi:10.1038/s41467-018-06575-6. PMC 6173750. PMID 30291239. ^ a b Scerri, Eric R. (2007). The periodic table: its story and its significance. Oxford University Press. pp. 239–240. ISBN 978-0-19-530573-9. ^ Miessler, G.L. and Tarr, D.A. (1999) Inorganic Chemistry 2nd ed., Prentice–Hall. p. 38. ISBN 0138418918. ^ Petrucci, R.H. et al. (2002) General Chemistry 8th ed., Prentice–Hall. p. 950. ISBN 0130143294. ^ a b NIST Atomic Spectrum Database To read the nickel atom levels, type "Ni I" in the Spectrum box and click on Retrieve data. ^ "The Most Tightly Bound Nuclei". Retrieved November 19, 2008. ^ a b Fewell, M. P. (1995). "The atomic nuclide with the highest mean binding energy". American Journal of Physics. 63 (7): 653. Bibcode:1995AmJPh..63..653F. doi:10.1119/1.17828. ^ Pagel, Bernard Ephraim Julius (1997). "Further burning stages: evolution of massive stars". Nucleosynthesis and chemical evolution of galaxies. pp. 154–160. ISBN 978-0-521-55958-4. ^ Castelvecchi, Davide (April 22, 2005). "Atom Smashers Shed Light on Supernovae, Big Bang". Retrieved November 19, 2008. ^ W, P. (October 23, 1999). "Twice-magic metal makes its debut – isotope of nickel". Science News. Archived from the original on May 24, 2012. Retrieved September 29, 2006. ^ National Pollutant Inventory – Nickel and compounds Fact Sheet. Npi.gov.au. Retrieved on January 9, 2012. ^ a b c Kuck, Peter H. "Mineral Commodity Summaries 2019: Nickel" (PDF). United States Geological Survey. ^ Rasmussen, K. L.; Malvin, D. J.; Wasson, J. T. (1988). "Trace element partitioning between taenite and kamacite – Relationship to the cooling rates of iron meteorites". Meteoritics. 23 (2): a107–112. Bibcode:1988Metic..23..107R. doi:10.1111/j.1945-5100.1988.tb00905.x. ^ "The Extraction of Nickel from its Ores by the Mond Process". Nature. 59 (1516): 63–64. 1898. Bibcode:1898Natur..59...63.. doi:10.1038/059063a0. ^ a b Housecroft, C. E.; Sharpe, A. G. (2008). Inorganic Chemistry (3rd ed.). Prentice Hall. p. 729. ISBN 978-0-13-175553-6. ^ Housecroft, C. E.; Sharpe, A. G. (2012). Inorganic Chemistry (4th ed.). Prentice Hall. p. 764. ISBN 978-0273742753. ^ Jensen, K. A. (1936). "Zur Stereochemie des koordinativ vierwertigen Nickels". Zeitschrift für Anorganische und Allgemeine Chemie. 229 (3): 265–281. doi:10.1002/zaac.19362290304. ^ Court, T. L.; Dove, M. F. A. (1973). "Fluorine compounds of nickel(III)". Journal of the Chemical Society, Dalton Transactions (19): 1995. doi:10.1039/DT9730001995. ^ "Imara Corporation Launches; New Li-ion Battery Technology for High-Power Applications". Green Car Congress. December 18, 2008. ^ Spokoyny, Alexander M.; Li, Tina C.; Farha, Omar K.; Machan, Charles M.; She, Chunxing; Stern, Charlotte L.; Marks, Tobin J.; Hupp, Joseph T.; Mirkin, Chad A. (June 28, 2010). "Electronic Tuning of Nickel-Based Bis(dicarbollide) Redox Shuttles in Dye-Sensitized Solar Cells". Angew. Chem. Int. Ed. 49 (31): 5339–5343. doi:10.1002/anie.201002181. PMID 20586090. ^ Hawthorne, M. Frederick (1967). "(3)-1,2-Dicarbollyl Complexes of Nickel(III) and Nickel(IV)". Journal of the American Chemical Society. 89 (2): 470–471. doi:10.1021/ja00978a065. ^ Camasso, N. M.; Sanford, M. S. (2015). "Design, synthesis, and carbon-heteroatom coupling reactions of organometallic nickel(IV) complexes". Science. 347 (6227): 1218–20. Bibcode:2015Sci...347.1218C. doi:10.1126/science.aaa4526. PMID 25766226. ^ Baucom, E. I.; Drago, R. S. (1971). "Nickel(II) and nickel(IV) complexes of 2,6-diacetylpyridine dioxime". Journal of the American Chemical Society. 93 (24): 6469–6475. doi:10.1021/ja00753a022. ^ Rosenberg, Samuel J. (1968). Nickel and Its Alloys. National Bureau of Standards. ^ a b McNeil, Ian (1990). "The Emergence of Nickel". An Encyclopaedia of the History of Technology. Taylor & Francis. pp. 96–100. ISBN 978-0-415-01306-2. ^ Needham, Joseph; Wang, Ling; Lu, Gwei-Djen; Tsien, Tsuen-hsuin; Kuhn, Dieter and Golas, Peter J. (1974) Science and civilisation in China. Cambridge University Press. ISBN 0-521-08571-3, pp. 237–250. ^ Chambers Twentieth Century Dictionary, p888, W&R Chambers Ltd., 1977. ^ a b Baldwin, W. H. (1931). "The story of Nickel. I. How "Old Nick's" gnomes were outwitted". Journal of Chemical Education. 8 (9): 1749. Bibcode:1931JChEd...8.1749B. doi:10.1021/ed008p1749. ^ Baldwin, W. H. (1931). "The story of Nickel. II. Nickel comes of age". Journal of Chemical Education. 8 (10): 1954. Bibcode:1931JChEd...8.1954B. doi:10.1021/ed008p1954. ^ Baldwin, W. H. (1931). "The story of Nickel. III. Ore, matte, and metal". Journal of Chemical Education. 8 (12): 2325. Bibcode:1931JChEd...8.2325B. doi:10.1021/ed008p2325. ^ Weeks, Mary Elvira (1932). "The discovery of the elements: III. Some eighteenth-century metals". Journal of Chemical Education. 9 (1): 22. Bibcode:1932JChEd...9...22W. doi:10.1021/ed009p22. ^ "Industrious, enduring–the 5-cent coin". Royal Canadian Mint. 2008. Retrieved January 10, 2009. ^ Molloy, Bill (November 8, 2001). 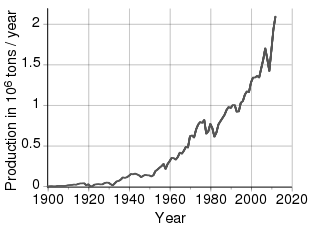 "Trends of Nickel in Coins – Past, Present and Future". The Nickel Institute. Archived from the original on September 29, 2006. Retrieved November 19, 2008. ^ a b Lacey, Anna (June 22, 2013). "A bad penny? New coins and nickel allergy". BBC Health Check. Retrieved July 25, 2013. ^ "nikkelen dubbele wapenstuiver Utrecht". nederlandsemunten.nl. ^ Kelly, T. D.; Matos, G. R. "Nickel Statistics" (PDF). U.S. Geological Survey. Retrieved August 11, 2014. ^ "Nickel" (PDF). U.S. Geological Survey, Mineral Commodity Summaries. January 2013. ^ "The Nickel Mountain Project" (PDF). Ore Bin. 15 (10): 59–66. 1953. Archived from the original (PDF) on February 12, 2012. Retrieved May 7, 2015. ^ "Environment Writer: Nickel". National Safety Council. 2006. Archived from the original on August 28, 2006. Retrieved January 10, 2009. ^ a b "Operations & Development". Lundin Mining Corporation. Archived from the original on November 18, 2015. Retrieved August 10, 2014. ^ Mond, L.; Langer, K.; Quincke, F. (1890). "Action of carbon monoxide on nickel". Journal of the Chemical Society. 57: 749–753. doi:10.1039/CT8905700749. ^ Neikov, Oleg D.; Naboychenko, Stanislav; Gopienko, Victor G & Frishberg, Irina V (January 15, 2009). Handbook of Non-Ferrous Metal Powders: Technologies and Applications. Elsevier. pp. 371–. ISBN 978-1-85617-422-0. Retrieved January 9, 2012. ^ "LME nickel price graphs". London Metal Exchange. Archived from the original on February 28, 2009. Retrieved June 6, 2009. ^ "London Metal Exchange". LME.com. ^ "United States Circulating Coinage Intrinsic Value Table". Coininflation.com. Retrieved September 13, 2013. ^ American Plumbing Practice: From the Engineering Record (Prior to 1887 the Sanitary Engineer.) A Selected Reprint of Articles Describing Notable Plumbing Installations in the United States, and Questions and Answers on Problems Arising in Plumbing and House Draining. With Five Hundred and Thirty-six Illustrations. Engineering record. 1896. p. 119. ^ Davis, Joseph R. (2000). "Uses of Nickel". ASM Specialty Handbook: Nickel, Cobalt, and Their Alloys. ASM International. pp. 7–13. ISBN 978-0-87170-685-0. ^ Kharton, Vladislav V. (2011). Solid State Electrochemistry II: Electrodes, Interfaces and Ceramic Membranes. Wiley-VCH. pp. 166–. ISBN 978-3-527-32638-9. ^ Bidault, F.; Brett, D. J. L.; Middleton, P. H.; Brandon, N. P. "A New Cathode Design for Alkaline Fuel Cells (AFCs)" (PDF). Imperial College London. Archived from the original (PDF) on July 20, 2011. 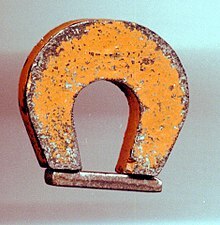 ^ Magnetostrictive Materials Overview. University of California, Los Angeles. ^ Angara, Raghavendra (2009). High Frequency High Amplitude Magnetic Field Driving System for Magnetostrictive Actuators. Umi Dissertation Publishing. p. 5. ISBN 9781109187533. ^ Cheburaeva, R. F.; Chaporova, I. N.; Krasina, T. I. (1992). "Structure and properties of tungsten carbide hard alloys with an alloyed nickel binder". Soviet Powder Metallurgy and Metal Ceramics. 31 (5): 423–425. doi:10.1007/BF00796252. ^ "Krytron Pulse Power Switching Tubes". Silicon Investigations. 2011. ^ a b c Astrid Sigel; Helmut Sigel; Roland K. O. Sigel, eds. (2008). Nickel and Its Surprising Impact in Nature. Metal Ions in Life Sciences. 2. Wiley. ISBN 978-0-470-01671-8. ^ a b c Sydor, Andrew; Zamble, Deborah (2013). Banci, Lucia (ed.). Nickel Metallomics: General Themes Guiding Nickel Homeostasis. Dordrecht: Springer. pp. 375–416. ISBN 978-94-007-5561-1. ^ Zamble, Deborah; Rowińska-Żyrek, Magdalena; Kozlowski, Henryk (2017). The Biological Chemistry of Nickel. Royal Society of Chemistry. ISBN 978-1-78262-498-1. ^ Covacci, Antonello; Telford, John L.; Giudice, Giuseppe Del; Parsonnet, Julie; Rappuoli, Rino (May 21, 1999). "Helicobacter pylori Virulence and Genetic Geography". Science. 284 (5418): 1328–1333. Bibcode:1999Sci...284.1328C. doi:10.1126/science.284.5418.1328. PMID 10334982. ^ Cox, Gary M.; Mukherjee, Jean; Cole, Garry T.; Casadevall, Arturo; Perfect, John R. (February 1, 2000). "Urease as a Virulence Factor in Experimental Cryptococcosis". Infection and Immunity. 68 (2): 443–448. doi:10.1128/IAI.68.2.443-448.2000. PMC 97161. PMID 10639402. ^ Stephen W., Ragdale (2014). "Chapter 6. Biochemistry of Methyl-Coenzyme M Reductase: The Nickel Metalloenzyme that Catalyzes the Final Step in Synthesis and the First Step in Anaerobic Oxidation of the Greenhouse Gas Methane". In Peter M.H. Kroneck; Martha E. Sosa Torres (eds.). The Metal-Driven Biogeochemistry of Gaseous Compounds in the Environment. Metal Ions in Life Sciences. 14. Springer. pp. 125–145. doi:10.1007/978-94-017-9269-1_6. ISBN 978-94-017-9268-4. PMID 25416393. ^ Wang, Vincent C.-C.; Ragsdale, Stephen W.; Armstrong, Fraser A. (2014). "Chapter 4. Investigations of the Efficient Electrocatalytic Interconversions of Carbon Dioxide and Carbon Monoxide by Nickel-Containing Carbon Monoxide Dehydrogenases". In Peter M.H. Kroneck; Martha E. Sosa Torres (eds.). The Metal-Driven Biogeochemistry of Gaseous Compounds in the Environment. Metal Ions in Life Sciences. 14. Springer. pp. 71–97. doi:10.1007/978-94-017-9269-1_4. ISBN 978-94-017-9268-4. PMC 4261625. PMID 25416391. ^ Szilagyi, R. K.; Bryngelson, P. A.; Maroney, M. J.; Hedman, B.; et al. (2004). "S K-Edge X-ray Absorption Spectroscopic Investigation of the Ni-Containing Superoxide Dismutase Active Site: New Structural Insight into the Mechanism". Journal of the American Chemical Society. 126 (10): 3018–3019. doi:10.1021/ja039106v. PMID 15012109. ^ Greig N; Wyllie S; Vickers TJ; Fairlamb AH (2006). "Trypanothione-dependent glyoxalase I in Trypanosoma cruzi". Biochemical Journal. 400 (2): 217–23. doi:10.1042/BJ20060882. PMC 1652828. PMID 16958620. ^ Aronsson A-C; Marmstål E; Mannervik B (1978). "Glyoxalase I, a zinc metalloenzyme of mammals and yeast". Biochemical and Biophysical Research Communications. 81 (4): 1235–1240. doi:10.1016/0006-291X(78)91268-8. PMID 352355. ^ Ridderström M; Mannervik B (1996). "Optimized heterologous expression of the human zinc enzyme glyoxalase I". Biochemical Journal. 314 (Pt 2): 463–467. doi:10.1042/bj3140463. PMC 1217073. PMID 8670058. ^ Saint-Jean AP; Phillips KR; Creighton DJ; Stone MJ (1998). "Active monomeric and dimeric forms of Pseudomonas putida glyoxalase I: evidence for 3D domain swapping". Biochemistry. 37 (29): 10345–10353. doi:10.1021/bi980868q. PMID 9671502. ^ Thornalley, P. J. (2003). "Glyoxalase I—structure, function and a critical role in the enzymatic defence against glycation". Biochemical Society Transactions. 31 (Pt 6): 1343–1348. doi:10.1042/BST0311343. PMID 14641060. ^ Vander Jagt DL (1989). "Unknown chapter title". In D Dolphin; R Poulson; O Avramovic (eds.). Coenzymes and Cofactors VIII: Glutathione Part A. New York: John Wiley and Sons. ^ Zambelli, Barbara; Ciurli, Stefano (2013). "Chapter 10. Nickel: and Human Health". In Astrid Sigel; Helmut Sigel; Roland K. O. Sigel (eds.). Interrelations between Essential Metal Ions and Human Diseases. Metal Ions in Life Sciences. 13. Springer. pp. 321–357. doi:10.1007/978-94-007-7500-8_10. ISBN 978-94-007-7499-5. PMID 24470096. ^ Nickel. IN: Dietary Reference Intakes for Vitamin A, Vitamin K, Arsenic, Boron, Chromium, Copper, Iodine, Iron, Manganese, Molybdenum, Nickel, Silicon, Vanadium, and Copper. National Academy Press. 2001, PP. 521–529. ^ Kamerud KL; Hobbie KA; Anderson KA (August 28, 2013). "Stainless Steel Leaches Nickel and Chromium into Foods During Cooking". Journal of Agricultural and Food Chemistry. 61 (39): 9495–501. doi:10.1021/jf402400v. PMC 4284091. PMID 23984718. ^ Flint GN; Packirisamy S (1997). "Purity of food cooked in stainless steel utensils". Food Additives & Contaminants. 14 (2): 115–26. doi:10.1080/02652039709374506. PMID 9102344. ^ Schirber, Michael (July 27, 2014). "Microbe's Innovation May Have Started Largest Extinction Event on Earth". Space.com. Astrobiology Magazine. .... That spike in nickel allowed methanogens to take off. ^ "Nickel 357553". Sigma Aldrich. ^ Haber, Lynne T; Bates, Hudson K; Allen, Bruce C; Vincent, Melissa J; Oller, Adriana R (2017). "Derivation of an oral toxicity reference value for nickel". Regulatory Toxicology and Pharmacology. 87: S1–S18. doi:10.1016/j.yrtph.2017.03.011. PMID 28300623. ^ Butticè, Claudio (2015). "Nickel Compounds". In Colditz, Graham A. (ed.). The SAGE Encyclopedia of Cancer and Society (Second ed.). Thousand Oaks: SAGE Publications, Inc. pp. 828–831. ISBN 9781483345734. ^ a b IARC (2012). “Nickel and nickel compounds” in IARC Monogr Eval Carcinog Risks Hum. Volume 100C. pp. 169–218..
^ a b Regulation (EC) No 1272/2008 of the European Parliament and of the Council of 16 December 2008 on Classification, Labelling and Packaging of Substances and Mixtures, Amending and Repealing Directives 67/548/EEC and 1999/45/EC and amending Regulation (EC) No 1907/2006 [OJ L 353, 31.12.2008, p. 1]. Annex VI. Accessed July 13, 2017. ^ a b Globally Harmonised System of Classification and Labelling of Chemicals (GHS), 5th ed., United Nations, New York and Geneva, 2013..
^ a b National Toxicology Program. (2016). “Report on Carcinogens”, 14th ed. Research Triangle Park, NC: U.S. Department of Health and Human Services, Public Health Service..
^ a b "Report of the International Committee on Nickel Carcinogenesis in Man". Scandinavian Journal of Work, Environment & Health. 16 (1 Spec No): 1–82. 1990. doi:10.5271/sjweh.1813. JSTOR 40965957. PMID 2185539. ^ a b "NTP Toxicology and Carcinogenesis Studies of Nickel Subsulfide (CAS No. 12035-72-2) in F344 Rats and B6C3F1 Mice (Inhalation Studies)". National Toxicology Program Technical Report Series. 453: 1–365. 1996. PMID 12594522. ^ "NTP Toxicology and Carcinogenesis Studies of Nickel Oxide (CAS No. 1313-99-1) in F344 Rats and B6C3F1 Mice (Inhalation Studies)". National Toxicology Program Technical Report Series. 451: 1–381. 1996. PMID 12594524. ^ Cogliano, V. J; Baan, R; Straif, K; Grosse, Y; Lauby-Secretan, B; El Ghissassi, F; Bouvard, V; Benbrahim-Tallaa, L; Guha, N; Freeman, C; Galichet, L; Wild, C. P (2011). "Preventable exposures associated with human cancers". JNCI Journal of the National Cancer Institute. 103 (24): 1827–39. doi:10.1093/jnci/djr483. PMC 3243677. PMID 22158127. ^ Heim, K. E; Bates, H. K; Rush, R. E; Oller, A. R (2007). "Oral carcinogenicity study with nickel sulfate hexahydrate in Fischer 344 rats". Toxicology and Applied Pharmacology. 224 (2): 126–37. doi:10.1016/j.taap.2007.06.024. PMID 17692353. ^ a b Oller, A. R; Kirkpatrick, D. T; Radovsky, A; Bates, H. K (2008). "Inhalation carcinogenicity study with nickel metal powder in Wistar rats". Toxicology and Applied Pharmacology. 233 (2): 262–75. doi:10.1016/j.taap.2008.08.017. PMID 18822311. ^ "NTP Toxicology and Carcinogenesis Studies of Nickel Sulfate Hexahydrate (CAS No. 10101-97-0) in F344 Rats and B6C3F1 Mice (Inhalation Studies)". National Toxicology Program Technical Report Series. 454: 1–380. 1996. PMID 12587012. ^ Springborn Laboratories Inc. (2000). “An Oral (Gavage) Two-generation Reproduction Toxicity Study in Sprague-Dawley Rats with Nickel Sulfate Hexahydrate.” Final Report. Springborn Laboratories Inc., Spencerville. SLI Study No. 3472.4. ^ Vaktskjold, A; Talykova, L. V; Chashchin, V. P; Nieboer, E; Thomassen, Y; Odland, J. O (2006). "Genital malformations in newborns of female nickel-refinery workers". Scandinavian Journal of Work, Environment & Health. 32 (1): 41–50. doi:10.5271/sjweh.975. PMID 16539171. ^ Vaktskjold, A; Talykova, L. V; Chashchin, V. P; Odland, Jon Ø; Nieboer, E (2008). "Spontaneous abortions among nickel-exposed female refinery workers". International Journal of Environmental Health Research. 18 (2): 99–115. doi:10.1080/09603120701498295. PMID 18365800. ^ Vaktskjold, A; Talykova, L. V; Chashchin, V. P; Odland, J. O; Nieboer, E (2007). "Small-for-gestational-age newborns of female refinery workers exposed to nickel". International Journal of Occupational Medicine and Environmental Health. 20 (4): 327–38. doi:10.2478/v10001-007-0034-0. PMID 18165195. ^ Vaktskjold, A; Talykova, L. V; Chashchin, V. P; Odland, J. O; Nieboer, E (2008). "Maternal nickel exposure and congenital musculoskeletal defects". American Journal of Industrial Medicine. 51 (11): 825–33. doi:10.1002/ajim.20609. PMID 18655106. ^ "CDC – NIOSH Pocket Guide to Chemical Hazards – Nickel metal and other compounds (as Ni)". www.cdc.gov. Retrieved November 20, 2015. ^ Stellman, Jeanne Mager (1998). Encyclopaedia of Occupational Health and Safety: Chemical, industries and occupations. International Labour Organization. pp. 133–. ISBN 978-92-2-109816-4. Retrieved January 9, 2012. ^ Barceloux, Donald G.; Barceloux, Donald (1999). "Nickel". Clinical Toxicology. 37 (2): 239–258. doi:10.1081/CLT-100102423. PMID 10382559. ^ Thyssen J. P.; Linneberg A.; Menné T.; Johansen J. D. (2007). "The epidemiology of contact allergy in the general population—prevalence and main findings". Contact Dermatitis. 57 (5): 287–99. doi:10.1111/j.1600-0536.2007.01220.x. PMID 17937743. ^ Nestle, O.; Speidel, H.; Speidel, M. O. (2002). "High nickel release from 1- and 2-euro coins". Nature. 419 (6903): 132. Bibcode:2002Natur.419..132N. doi:10.1038/419132a. PMID 12226655. ^ Dow, Lea (June 3, 2008). "Nickel Named 2008 Contact Allergen of the Year". Nickel Allergy Information. Archived from the original on February 3, 2009. ^ Salnikow, k.; Donald, S. P.; Bruick, R. K.; Zhitkovich, A.; et al. (September 2004). "Depletion of intracellular ascorbate by the carcinogenic metal nickel and cobalt results in the induction of hypoxic stress". Journal of Biological Chemistry. 279 (39): 40337–44. doi:10.1074/jbc.M403057200. PMID 15271983. ^ Das, K. K.; Das, S. N.; Dhundasi, S. A. (2008). "Nickel, its adverse health effects and oxidative stress" (PDF). Indian Journal of Medical Research. 128 (4): 117–131. PMID 19106437. Retrieved August 22, 2011. 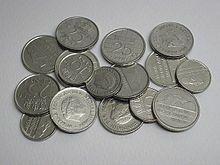 Wikimedia Commons has media related to Nickel. This page was last edited on 18 April 2019, at 23:19 (UTC).